While they do excel at many things, their Achilles heel for plant-based dieters is the fact that up until recently, all of their patties pretty much sucked. 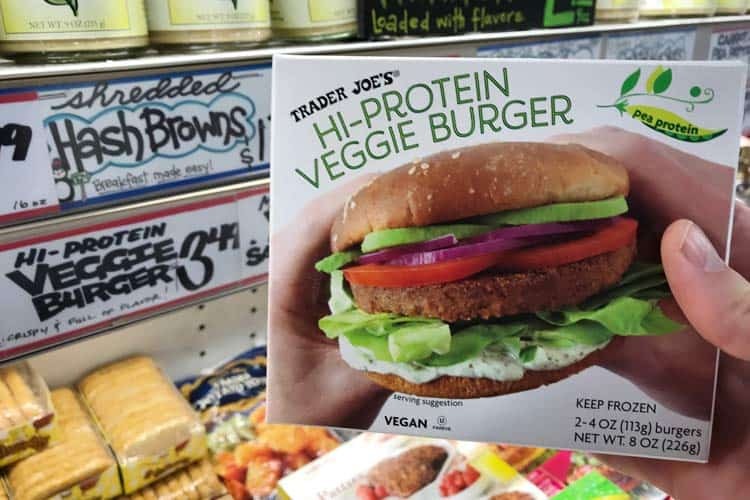 Sure, they do carry Dr. Praeger’s brand, and the Trader Joe’s vegetable masala burger is vegan. The problem is that both of those are high carb, high fat, and low protein. In the masala veggie patties, the first ingredient is potato and the second is canola oil. 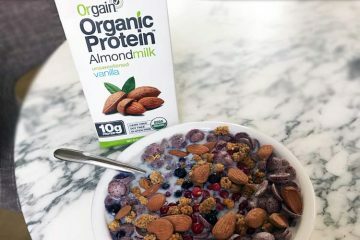 There’s a whopping 2g of protein per 120 calories. Their latest vegan burger isn’t perfect, though it is a huge improvement. 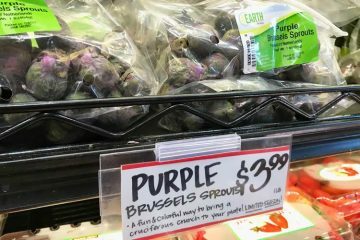 With the exception of loading up on several pounds of their frozen wild blueberries and raspberries, normally we skip the frozen food aisle. 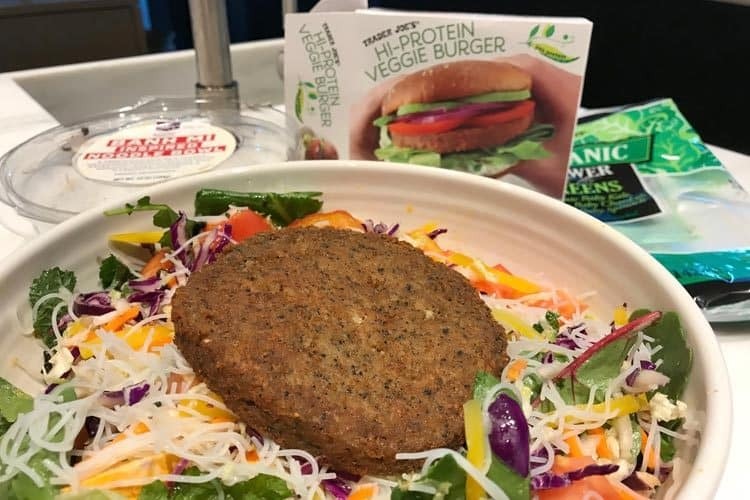 A new “hi-protein” patty that also sports the word vegan on the box. At $3.49 for two, it’s $1.75 per patty. Not a bad price. 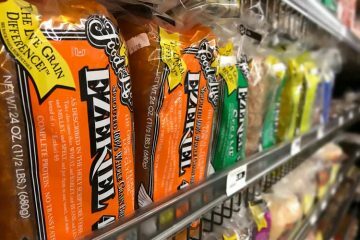 Especially when compared to Beyond Burger patties, which run $5.99 for a two-pack. Each Trader Joe’s high-protein veggie burger contains 26g of protein for 260 calories. 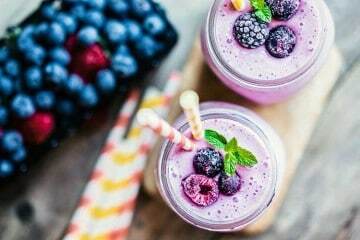 Since protein is 4 calories per gram, it means 104 calories (40%) are coming from the amino acids. The other 60% of calories come from fat (13g) and carbs (12g). Since fat is 9 calories per gram, it means 117 calories are in the form of fat. 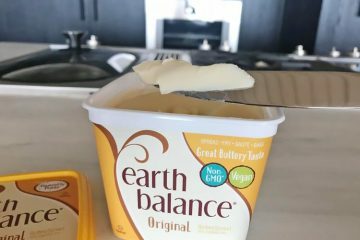 Somewhat keto friendly, since less than 20% of the calories are from carbs. 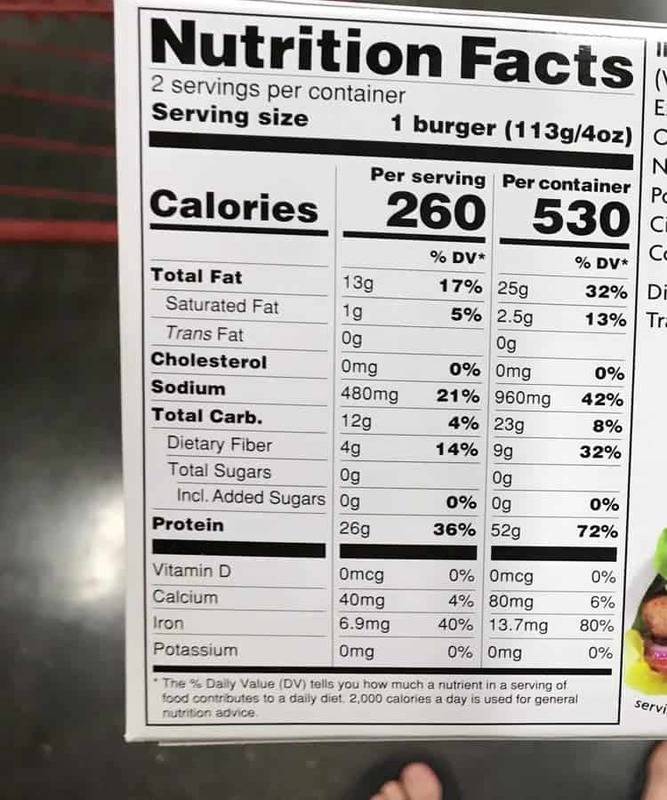 As with most frozen foods, perhaps the biggest downside is that each of these patties has 480 mg of sodium. 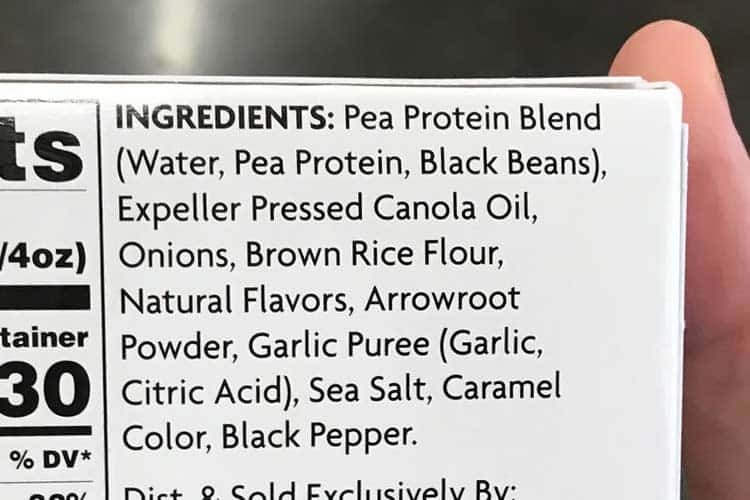 The first ingredient in the patty is “pea protein blend” which consists of pea protein and black beans. Unlike many vegan meats, this patty is gluten free. They’re not combining vital wheat gluten and soy protein isolate like what Tofurky, Gardein, Sweet Earth, Boca, and most other brands do. It’s unclear what the “natural flavors” are but it’s clear that all of the ingredients must be vegan. It says that on the front of the box. The Trader Joe’s high protein veggie burger is already pre-cooked. When you un-wrap the frozen patty, you will see and feel that it has been fried. Therefore, all you have to do is heat it up. Cooking isn’t necessary. 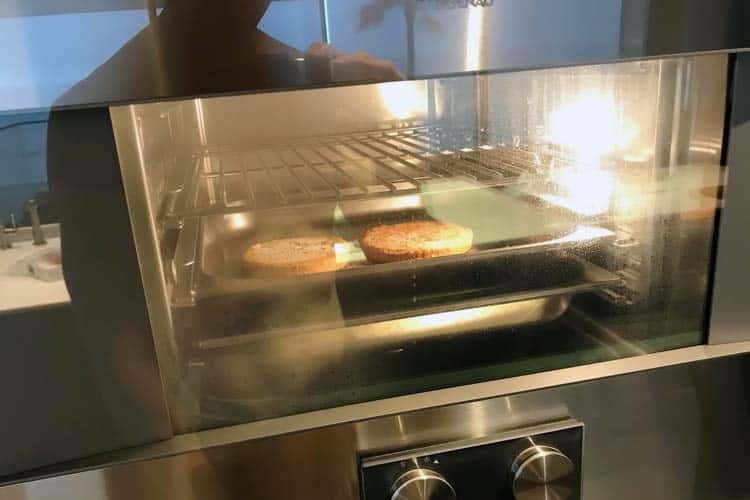 To heat it up, the instructions say the preferred method is to place the patty in a preheated oven at 450° F (230° C) for 10 minutes, flip, and then bake for another 10 minutes. Microwaving the burger on high for 45-60 seconds, flipping, and then zapping for another 30 seconds is an alternate cooking method listed. Generally, we bake at temperatures below 250° F to minimize the formation of acrylamide. Though it probably makes little difference here, given that TJ’s has already fried it. So we baked it at around 325° F for 15-20 minutes in a steam oven, flipping half-way through. At a lower temp, you will have to keep it in the oven longer. 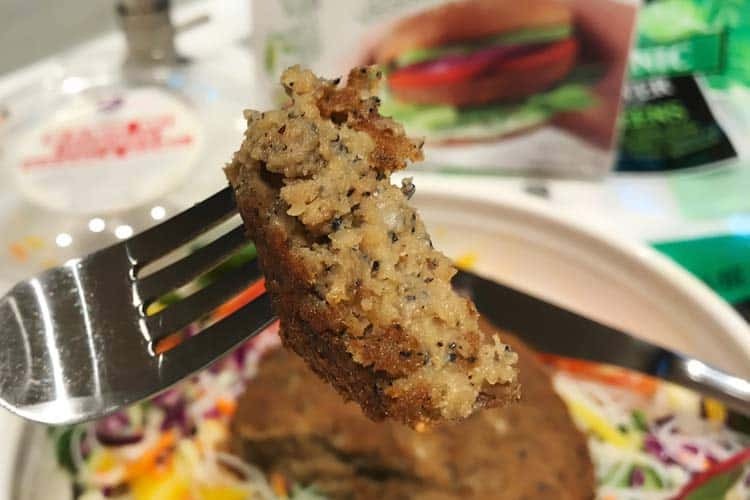 The high-protein veggie burger by Trader Joe’s tastes like meatloaf meets chicken. It’s a cross between those two flavors. Your tongue can’t really distinguish the flavor of any specific vegetable inside. Among the spices, the garlic and black pepper is mild, though you definitely taste the high sodium content. In some ways, the flavor and crumbly texture is similar to vegan protein cookies. 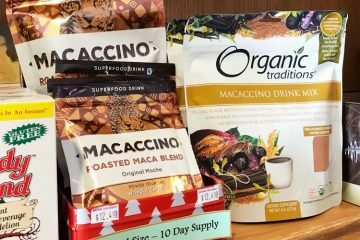 This is because pea protein has a subtle, yet unique flavor that your taste buds will detect when it’s used in high concentration. It tastes good, but then again, anything loaded with salt and oil will! Our favorite characteristic about this new veggie burger is that it is not trying to replicate the texture of real meat. That’s something we dislike about Beyond Burger. If we wanted real meat, then we wouldn’t be vegan in the first place! The $3.49 price is about the same as Trader Joe’s organic wine. Grab a bottle of that, a package of these patties, and toss ’em on some fresh greens. You’ll have a relatively healthy easy-to-make meal for two that costs <$15 total. In this case, the price is more like $20. The Trader Joe’s banh mi salads are $4.99 a pop, the bag of power greens is $1.99, and we switched out the dressing to their plant-based and cold-pressed ginger miso which runs $2.99 a bottle. All in all, these burgers are not the worst choice you could make.